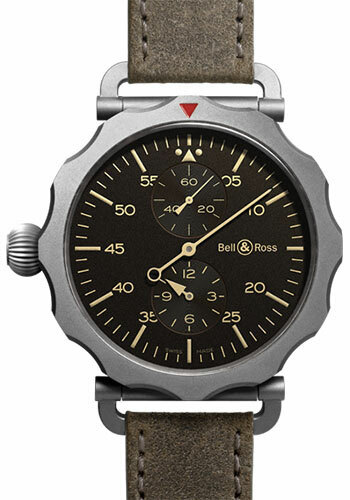 49 mm sandblasted steel case with grey pvd finish, bidirectional notched bezel, sapphire crystal with anti-reflective, aged brown dial with numerals, index and hands covered in a sand-colored photo-luminescent coating, automatic movement with hours, minutes, seconds, distressed calfskin strap, pin buckle with grey pvd finish. Water resistant to 50 meters. 47 mm polished steel case, bi-directional rotating bezel with engraved marking, sapphire crystal with anti-reflective coating, black dial with silver hours and seconds counters. metal appliqué indices, calibre br-cal.316. automatic movement with regulator. hour counter at 12 o'clock, central minutes and small seconds counter at 6 o'clock, black alligator strap, polished steel pin buckle. Water resistant to 50 meters.